Astonishing as it may seem, the stage adaptation of this Dostoyevsky masterwork lasts only 90 minutes, yet it captures the emotional, psychological, and spiritual essence of the novel. Most of us can recall the story basics from some point in our education: Raskolnikov, an impoverished former student, publishes an article that argues for the amorality of "extraordinary persons." In an act of desperation as much as idealism, he kills a testy old pawnbroker and, as events dictate, her charming sister. The novel is one of the greatest psychological portraits in Western literature; indeed, most of the story takes place in Raskolnikov's mind. Marilyn Campbell and Curt Columbus' script leverages this point-of-view by rearranging the sequence of events, which become the stuff of Raskolnikov's dreams and memories in the compressed timeline of the stage play. Within this claustrophobic and troubled space, we witness the inspector, Porfiry (Chris Kendall), slowly reel in the disintegrating Raskolnikov (James O'Hagan-Murphy). Kendall's Porfiry is the rudder in the rough seas of Raskolnikov's tempest, anchored in the faith that his man will see the light of confession. As if by some spiritual force, this is what happens. We are mesmerized by Murphy's finely tuned portrait, in which Raskolnikov's features and physique crumble before our eyes, as he, the would-be übermensch, under the relentless watch of Porfiry, comes to realize he is subject to the same universal laws as everyone else. Ultimately, Raskolnikov confesses first to Sonia (Crystal Verdon Eisele), who walks the street to support her family in lieu of her father, Semyon (Kendall), a drunkard. Eisele radiates an inner illumination not unlike that of her recent winged appearance in Angels in America. 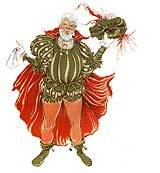 Her gear-shifting abilities are impressive; she also portrays the avaricious pawnbroker and her guileless sister. 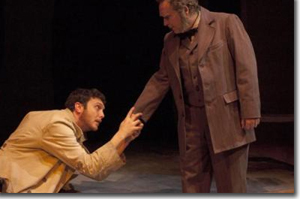 Just as Sonia gently persuades Raskolnikov that he must come clean before his maker, so she persuades us that we must do the same. To do this, Dostoyevsky argues, we must forgive ourselves and others, just as we are forgiven. Tina Anderson's strategic set leaves Raskolnikov nowhere to go but inside—an alchemical process illuminated by director John Thornberry's atmospheric sound design, Steven McDonald's subliminal lighting, and Kevin Brainerd's authentic costumes. Consciousness has a price, but it is not one that we set. Such a valuation, Dostoyevsky reveals, comes from a higher power, as we are shown most insistently by Porfiry, Sonia, and ultimately Raskolnikov, each with their unique perspective on the mysteries of faith. 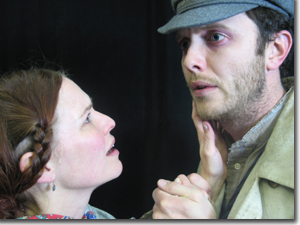 Boulder Ensemble Theatre's production of Crime and Punishment runs through March 5th. 303-444-7328 or www.the dairy.org.